Because of the well succeeded SE-headphone amplifier I wondered what the difference would be in listening to an electrolytic capacitor in stead of an output transformer. The pro's of a Single Ended amplifier are as many as the cons so I decided to build a headphone amplifier using an electrolytic as output device as well... When you're looking for headphone amplifiers out on the web, you'll quickly end up at Headwize, where almost everything about headphones can be found. One thing I noticed is that often two or more triodes are used with the last stage as cathode follower. 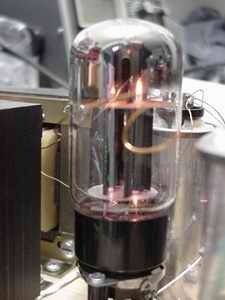 Sometimes these last triode is parallelled to increase gm and decrease Rp... The output impedance is determined by the tube's gm, being 1/gm.. If you take a triode with a gm of 25mA/V you'll get a output impedance of about 40ohms. This means that if a 32ohm headphone is to be used, a very steep tube is to be used as well. I thought: Why not use a penthode? There are more penthodes with a high gm available at affordable prices than triodes! The plan: If using a penthode as cathode follower why not use the mu-stage? 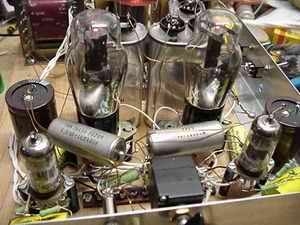 This stage combines a triode and a penthode in which the penthode will provide in a optimum load for the triode. This penthode is connected as cathode follower and if using a high gm tube, will have very low output impedance whilst giving the triode his full mu! 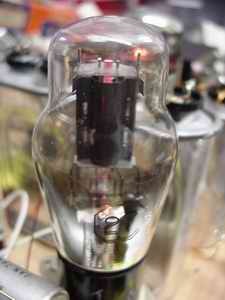 This way a very good sounding triode can be used without being forced to use one with a high gm.. If a 32ohm headphone is driven through an output capacitor, this capacitor has to be 220mF minimum which will give a roll of of about 22HZ at -3dB.. This means an electrolytic is to be used here. Mostly you'll see this electrolytic being parallelled by a low value paper-in-oil or something else exotic. These values drift between 0.1mF and 1mF. Seeing this I thought of making the electrolytic "switchable", so this amp could be as good a preamp as a headphone amp! The sound: Wow! From reading articles I suspected that using an electrolytic couldn't be that disastrous, and right they are! Very clean sound, tight bass and nicer: this all can be "tuned" by swapping the parallell oil to your liking! I tried up to 1000mF alectrolytic, but came to the conclusion that a 220mF is more than sufficient when driving 32ohm headphones (that is: my Philips SBC HP890).. Is it better than the SE headphone amp? No, not better! They both have their own benefits but one thing's for sure: the mu-stage is more versatile! 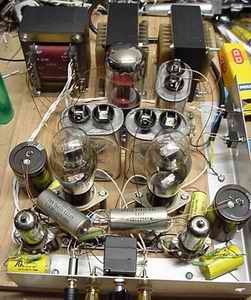 I will make a nice enclosure for this pre-amp, all to be followed here! You can look at the schematic here.